Minerals Beginning with "A" through "Ay"
JC9754. Actinolite pseudo diopside (uralite). Calumet mine, Turrett district, Chaffee county, Colorado. 3.5 x 4 x 5 cm 93g. $12.00. Nice little etched out vug filled with crystals. JC9755. Actinolite pseudo diopside (uralite). Calumet mine, Turrett district, Chaffee county, Colorado. 3 x 3.5 x 6 cm 113g. $8.00. JC9516. Adamite. Ojuela mine, Mapimi, Durango, Mexico. 7.5 x 11.5 cm 180g. $275.00 A classic flat plate of yellow green adamite. The individual groups are somewhat flattened cogwheels as seen a little better in the close up below. JC9499. Adamite. Ojuela mine, Mapimi, Durango, Mexico. 4.5 x 7 cm 215g. $45.00 Yellow to slightly greenish yellow fan like sprays of adamite. JC9457. Adamite. Ojuela mine, Mapimi, Durango, Mexico. 5 x 7.5 cm 107g. $50.00. Most adamite from the Ojuela is various shades of yellow to lime green to shades of blue and blue green. Much less common are the clear crystals as seen here. JC9060. Adamite. Ojuela mine, Mapimi, Durango, Mexico. 6 x 8.5 cm 183g. $25.00. Light green adamite, with the crystals on the left side included with red hematite. JC8919. Adamite. Ojuela mine, Mapimi, Durango, Mexico. 7.5 x 9 cm 112g. $15.00. brown balls of adamite on hematitic matrix. JC8909. Adamite. Ojuela mine, Mapimi, Durango, Mexico. 6 x 8 cm 131g. $35.00. Brown balls of adamite on top of and sandwiched between layers of hematite gossan. JC8628. Adamite. Ojuela mine, Mapimi, Durango, Mexico. 7 x 8 cm 287g. $40.00. Fans of very pale yellow adamite crystals. ON SALE, TAKE 20% OFF THE MARKED PRICE. JC8543. Adamite. Ojuela mine, Mapimi, Durango, Mexico. 5 x 7 cm 149g. $75.00. Sharp crystals rather than the more usual somewhat botryoidal material. Crystals are a bright yellow. ON SALE, TAKE 20% OFF THE MARKED PRICE. JC8322. Adamite. Ojuela mine, Mapimi, Durango, Mexico. 2.5 x 4.5 cm 27g. $50.00. A half sphere that is 2.5 cm wide. The back side of the sphere has been sheared off. Shows well from the front. ON SALE, TAKE 20% OFF THE MARKED PRICE. JC8322. A vertical view showing the missing half. JC8322. Another view from the front. JC7681. 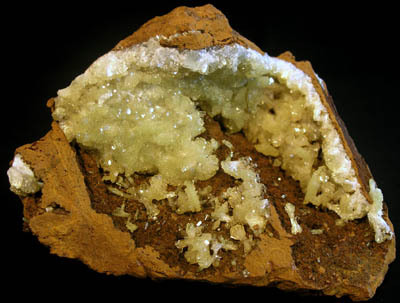 Adamite (cuprian). Ojuela mine, Mapimi, Durango, Mexico. 4.5 x 8 cm 103g. $75.00. Nice sparkly specimen of bluish green/greenish blue adamite. ON SALE, TAKE 20% OFF THE MARKED PRICE. JC7256. 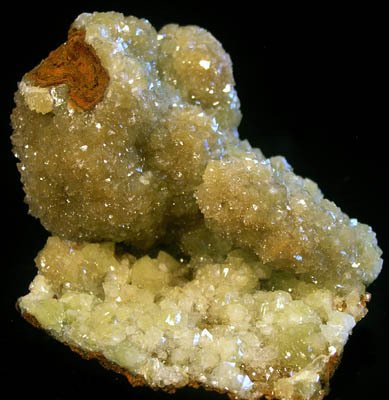 Adamite (cuprian). Ojuela mine, Mapimi, Durango, Mexico. 6.5 x 8 cm 184g. $100.00 Bluish green crystals on brownish red hematite. From the find of a few years ago. These specimens vanished from the market very quickly. JC7256. A close up view. JC7136. Adamite. Ojuela mine, Mapimi, Durango, Mexico. 2.5 x 3.5 cm 25g. $35.00. Light bluish to light green crystals. Uncommon color for adamite from the Ojuela mine. Purchased from Harvey Gordon in 1983. JC6875. Adamite. Ojuela mine, Mapimi, Durango, Mexico. 4 x 8 cm 119g. $55.00. Nice bright yellow to honey yellow crystals. ON SALE, TAKE 20% OFF THE MARKED PRICE. JC6658. Adamite. Ojuela mine, Mapimi, Durango, Mexico. 5.5 x 6 cm 105g. $75.00 Old Suzy Davis specimen purchased at Tucson in 1972. Brilliant coating on hematitic matrix. ON SALE, TAKE 20% OFF THE MARKED PRICE. JC5059. Adamite. Dachaang Sn-polymetallic ore field, Nandan Co., Hechi prefecture, Guangxi Zhuang autonomous region, China. 5 x 7 cm 99g. $35.00. ON SALE, TAKE 20% OFF THE MARKED PRICE. JC4005. Adamite. Ojuela mine, Mapimi, Durango, Mexico. 7.5 x 9 cm 355g. $70.00 Light yellow crystals. Two views shown. Displays well either on its side, or standing on end. The crystals are clear, gemmy, and a light yellow that was very hard to capture in the photos. Better in person. From the finds of the 1970's. ON SALE, TAKE 20% OFF THE MARKED PRICE. JC4023 Adamite. Ojuela mine, Mapimi, Durango, Mexico. 6 x 7.5 cm 117g. $50.00. Light yellow green crystals. From the finds of the 1970's.ON SALE, TAKE 20% OFF THE MARKED PRICE. JC4054. Adamite. Ojuela mine, Mapimi, Durango, Mexico. 8 cm x 8 cm 211g. $125.00. From the finds of the 1970's. 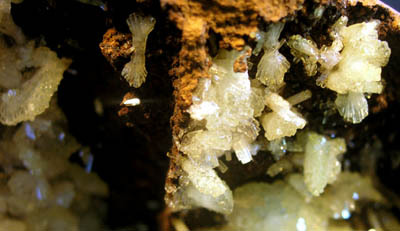 Bright, light yellow small cog-wheel sprays of adamite. Two views are shown. ON SALE, TAKE 20% OFF THE MARKED PRICE. JC7744. 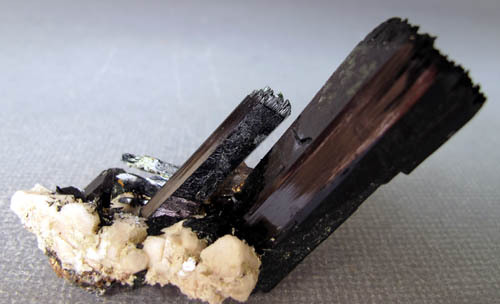 Adularia, hematite. St. Gotthard, Leventina, Ticino, Switzerland. 2.5 x 3 cm 17ig. $45.00. Hematite on the upper right, with a translucent adularia crystal dominating the front of the piece. Older specimen ON SALE, TAKE 20% OFF THE MARKED PRICE. JC7745. 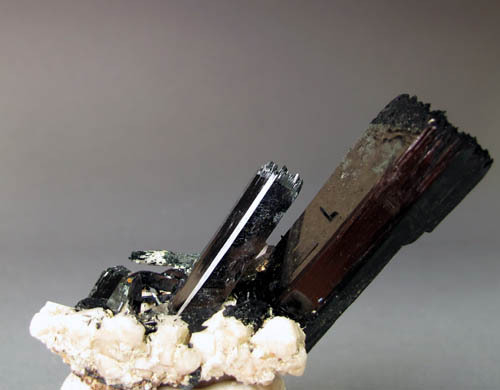 Adularia, hematite. St. Gotthard, Leventina, Ticino, Switzerland. 2 x 2.5 cm 7g. $35.00. A single adularia crystal dominates the right end of this thumbnail specimen. 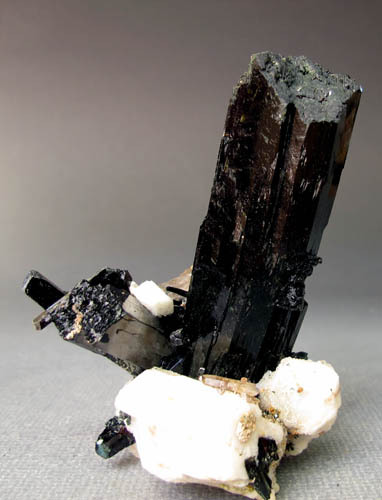 A little group of hematite crystals sits on the base of the adularia crystal. Older piece. ON SALE, TAKE 20% OFF THE MARKED PRICE. JC7746. Adularia (faden), actinolite. Alchuri, Shigar valley, Northern area, Pakistan. 6 x 7 cm 61g. $45.00. Vertically standing transparent/translucent crystal with faden zoning. Tough to photograph. Better in person. ON SALE, TAKE 20% OFF THE MARKED PRICE. JC7672. 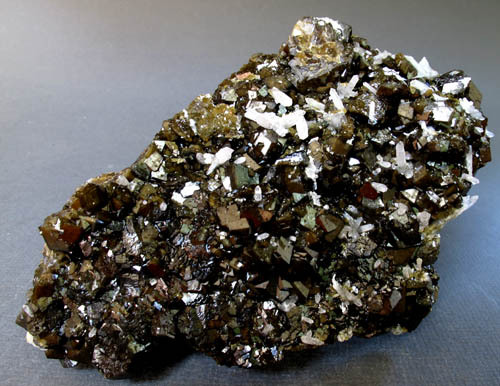 Adularia, chlorite. Hohe Tavern mountains, Salzburg, Teufelsmuhle, Habachtal, Austria. 5.5 x 9 cm 134g. $75.00. Well defined and chlorite included adularia crystals. ON SALE, TAKE 20% OFF THE MARKED PRICE. JC6801. Aegerine, albite. Mt. Malosa, Domasi, Zomba dist., Malawi. 7 cm x 10 cm tall. 201g. $200.00. An 8 cm tall stout crystal. There is an offshoot crystal on the left side. Both crystals, as well as the small crystals are terminated. The main crystal has a flat termination as seen, the offshoot crystal has a flat termination with many small terminations, giving it a somewhat ragged look, but neither are damaged. An attached crystal was present on the lower right side of the big crystal, and this is missing, leaving a notch in the large crystal. Color is a very dark green, almost black. Good luster on the side prisms. ON SALE, TAKE 20% OFF THE MARKED PRICE. JC6802. Aegerine, albite, quartz. Mt. Malosa, Domasi, Zomba dist., Malawi. 5.5 x 6 x 5 cm 59g. $150.00. Two crystals, the larger is slightly over 5 cm tall. Measured on the diagonal, from the top of the large crystal to the left side of the matrix is 8 cm. 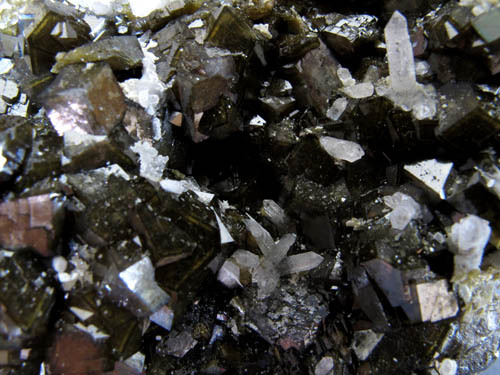 Both crystals have bright luster, dark greenish black luster, and these odd, rather ragged terminations which are made up of many small terminations across a flat top. There is no damage to the terminations. JC9286. Albite, axinite. New Melones dam spillway, Calaveras county, California. 5 x 7.5 cm 161g. $25.00. An older piece collected in the early 1980's. There are near micro sized axinite and epidote crystals on the back side. JC9286. Reverse side, with albite, epidote, and small axinites. JC4260. Albite (cleavelandite). Crystal Creek, Teller county, Colorado. 5.5 x 7.5 cm 134g. $20.00. A mass of white cleavelandite with a hexagonal hole in the middle, presumably where a now absent quartz crystal used to be. JC4254. Albite, quartz. Crystal creek, Teller county, Colorado. C: 2006. 8 x 8 cm 139g. $25.00. A mound of albite with a small smoky quartz crystal implanted on it. JC7839. Almandine, schorl. Shigar valley, Gilgit division, Pakistan. 4.5 cm tall. $50.00. A 2.5 cm, wine red, partial crystal perched on the end of a schorl crystal. ON SALE, TAKE 20% OFF THE MARKED PRICE. JC8758. Alergentum. Bouismas mine, Bouismas, Bou Azer district, Tazenakht, Ouarzazate province, Souss-Massa-Draa region, Morocco. 5.5 x 8 cm diagonal. 56g. $175.00. Embedded in calcite. Three views shown. JC8759. Allargentum. Penn Canadian mine (Glenn Lake mine), Coleman township, Cobalt area, Cobalt-Gowganda region, Timiskaming district, Ontario, Canada. 3 x 6.5 cm 61g. $225.00. Nice bunch of crystals scattered through calcite. Rare occurrence for Canada these days, and not often seen for sale. JC4241 Amazonite. Crystal Creek, Teller county, Colorado. 3.8 cm tall x 5 cm wide. 84g. $35.00 A single, powder blue crystal with some satellite crystals around the base. The crack is a shrinkage crack and does not extend through the crystal. JC4241. Another view. The cracks are shrinkage cracks and do not extend through the crystal. JC6012. Amazonite. Crystal Creek, Teller county, Colorado. 4 x 4 cm 52g. $10.00 A powder blue crystal on light colored microcline. JC4238. Amazonite. Crystal Creek, Teller county, Colorado. 5 x 7 cm 136g. 4.3 cm double terminated crystal. $20.00 ON SALE, TAKE 20% OFF THE MARKED PRICE. JC7743. Analcime. Fengjiashan mine, (Daye Copper mine), Daye county., Huangshi prefecture, Hubei province, China. 3 x 4.3 cm 35g. $60.00. Transparent to translucent crystals. The transparency of the crystals makes it a little difficult to see the glassy crystal faces. ON SALE, TAKE 20% OFF THE MARKED PRICE. JC7756. Analcime, quartz. Fengjiashan mine, (Daye Copper mine), Daye county., Huangshi prefecture, Hubei province, China. 4 x 5 cm 63g. $70.00. Gemmy analcime crystals on white quartz crystals ON SALE, TAKE 20% OFF THE MARKED PRICE. JC7659. Anatase on quartz. Kharan, Balochistan, Pakistan. 4 x 6 cm $50.00. A 7mm crystal on quartz from the 2004 find. Nice sharp crystal. ON SALE, TAKE 20% OFF THE MARKED PRICE. JC7659. Another view. There is just a hint of blue to the crystal. JC9778. Andradite var. topazolite, var. demantoid, var. melanite. New Idria district, Serpentine dome (near the benitoite location), San Benito county, California. 4 x 12 cm 363g. $95.00. The face of this specimen is completely covered with tiny (up to 2mm) crystals of all three varieties. Although small crystals, they have brilliant luster and the entire piece sparkles nicely when moved in the light. Better in person. The camera cannot show the sparkle of the piece. An older specimen. JC9778. Another view, slightly more exposure. JC9778. Close up view of upper right. JC9774. Andradite. Garnet Hill, Calaveras county, California. 3 x 3.5 x 9 cm 198g. $85.00. From California's premier garnet location is this piece with no damage to all the main crystals, with brilliant luster, and the typical brown/red brown color of the crystals. JC9503. Andradite (demantoid), Green Fire mine, New Idria district, Serpentine dome, San Benito county, California. 5 x 9 cm 284g. $60.00. Pale yellowish green crystals on a serpentine/crossite? matrix. JC9504. Andradite. Garnet Hill mine, Garnet Hill, Calaveras county, California. 5 x 8.5 cm 180g. $75.00. Nice hand specimen from this well known locality. Brilliant luster root beer brown crystals with a hint of reddish brown. This specimen was broken out of a quartz block, and a few of the crystals left their corners in the quartz, which is quite common for these specimens. This is the case for the largest central crystal in the right center, where the left corner is missing a bit. Generally good condition for one of these, and probably dates back 20 years or more. Nothing has come from the mine recently, as it has been very heavily collected. JC9504. A slightly different angle, as I tilted it up slightly. JC9498. Andradite (demantoid), Green Fire mine, New Idria district, Serpentine dome, San Benito county, California. 7 x 8.5 cm 307g. $65.00. Pale yellow to greenish yellow crystals with dark green clinochlore. JC9328. Andradite. Kembele, Arrondissement Diakon, Cercle de Bafoulabe, Kayes region, Mali. 5 x 7.5 cm 154g. $45.00 Almost black crystals. Sold as "melanite", but on close inspection I think it is just very dark andradite. JC9280. Melanite garnet. Benitoite (Dallas) gem mine area, San Benito county, California. 10 x 10 cm 538g. $18.00. I collected this one about 35 years ago. Tiny, sparkly melanite garnet scattered on both sides of the specimen. JC8620. Melanite. San Benito county, California. 5 x 6.5 cm 201g. $30.00 Satiny to glassy luster black crystals. Collected in the 1970's by Al McGuiness. These are pretty much unavailable these days as the locality is closed. JC7374. Andradite, epidote, quartz. Garnet Hill, Moore's creek, Calaveras county, California. 4.5 x 5.5 cm 111g. $50.00. 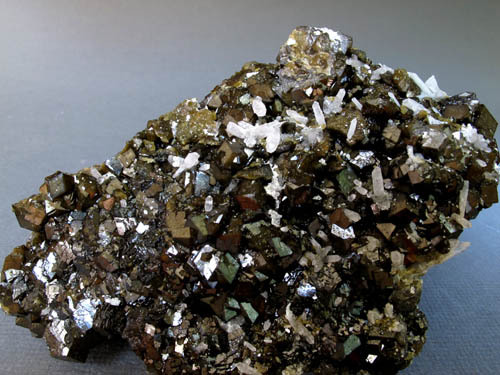 A group of brown, glassy luster andradite crystals up to 2.5 cm across, perched on some epidote and quartz. An older piece, circa 1970's from this famous location. JC6386. Andradite, quartz. Huanggang mine complex, KeshiketengBanner (Keshiketeng county), Ulanhad League (Chifeng prefecture), Inner Mongolia, China. 9 x 14 cm 572g. $250.00. The luster is excellent, glassy and bright. Highly reflective, making it tough to photo. Three close ups are shown below. This one has a darker olive green color. The front is decorated with quartz crystals giving a nice contrast. JC6386. Close up of upper right center area. JC6386. Close up of right center area in above photo. JC6386. Close up of lower left area. JC7917. Anglesite. Monteponi mine, Iglesias, Carbonia-Iglesias province, Sardinia, Italy. 5 x 5 cm 214g. $75.00. Grayish crystals coating the top two thirds of the matrix. The white spot is where crystals used to be. Rare specimen from this long closed mine. JC9732. Apatite, muscovite. Tormiq valley, Haramosh mountains, Skardu district, Baltistan, Pakistan. 2.5 x 3.5 cm 26g. $10.00. Single crystal on muscovite with minor albite?. Clean crystal, with no obvious damage. JC9495. Apatite. Cerro de Mercado mine, Victoria de Durango, Cerro de los Remedios, Mun. de Durango, Durango, Mexico. 5 x 5 x 5.5 cm 161g. $45.00. A 2.5 cm gem crystal on the left side, and a 2.5 cm gem crystal with a broken tip also present. Matrix is an agate (chalcedony) like material that the apatite crystals are embedded in. JC7871. Apophyllite, quartz. Jalgoan district, Maharashtra, India. 8.5 x 10 cm 756g. A single apophyllite perched on drusy quartz. $35.00. ON SALE, TAKE 20% OFF THE MARKED PRICE. JC8773. Aragonite. Vista Pit, Twin creeks mine, near Golgonda, Humboldt county, Nevada. .5 x 9 cm 183g. $45.00 Nice spray of crystals. Unusual for the locality. JC8975. Aragonite. Berryman tunnel, Prospect ridge, Eureka district, Eureka county, Nevada. 6 x 9 cm tall. 288g. $35.00. A one time find of several years ago. Very three dimensional really exquisite aragonite specimen from here. This was a limited find of very nice aragonite. Better in person. JC8977. Aragonite. Berryman tunnel, Prospect ridge, Eureka district, Eureka county, Nevada. 6.5 x 6.5 cm 148g. $30.00 A one time find of several years ago. Very three dimensional really exquisite aragonite specimen from here. This was a limited find of very nice aragonite. Better in person. JC8979. Aragonite. Berryman tunnel, Prospect ridge, Eureka district, Eureka county, Nevada. 6 x 8 cm tall. 101g. $35.00 A one time find of several years ago. Very three dimensional really exquisite aragonite specimen from here. This was a limited find of very nice aragonite. Better in person. JC8981. Aragonite. Berryman tunnel, Prospect ridge, Eureka district, Eureka county, Nevada. 8.5 x 8.5 cm 338g. $40.00. A one time find of several years ago. Very three dimensional really exquisite aragonite specimen from here. This was a limited find of very nice aragonite. Better in person. JC8983. Aragonite. Berryman tunnel, Prospect ridge, Eureka district, Eureka county, Nevada. 7 x 7 x 9 cm diagonal. 181g. $30.00 A one time find of several years ago. Very three dimensional really exquisite aragonite specimen from here. This was a limited find of very nice aragonite. Better in person. JC8984. Aragonite. Berryman tunnel, Prospect ridge, Eureka district, Eureka county, Nevada. 7 x 8 cm 344g. $40.00 A one time find of several years ago. Very three dimensional really exquisite aragonite specimen from here. This was a limited find of very nice aragonite. Better in person. JC9517. 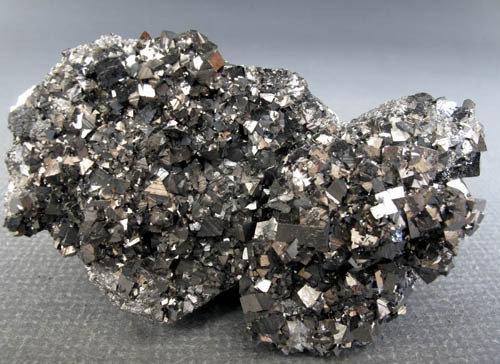 Arsenopyrite, pyrite. Huanzala Mine, Huallanca District, Dos de Mayo Province, Hu�nuco Department, Peru. 10 x 12 cm >1000g. $250.00. An older piece, ex: Reo Pickens (dealer), ex Ted Bartels collection. 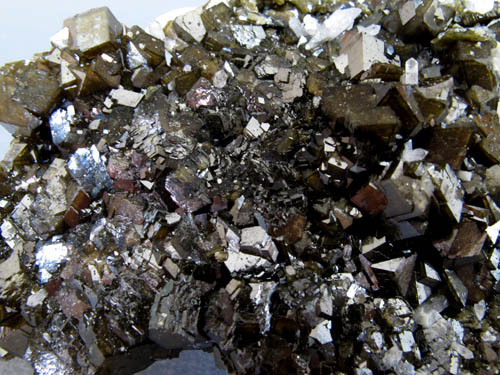 Dense radial sprays of splendant, arsenopyrite prisms dramatically cover the large mounded specimen from the famous Huanzala Mine. The prisms reach 2.2 cm and have sharp chisels terminations. The prisms rest on a thin bed of tiny, splendent, brassy pyritohedrons, which adds more appeal to this very rich large combination. Overall, the piece is in excellent condition, given the crystal density. A small area with bruised crystals is noted, but certainly has minimal impact to the fine quality. 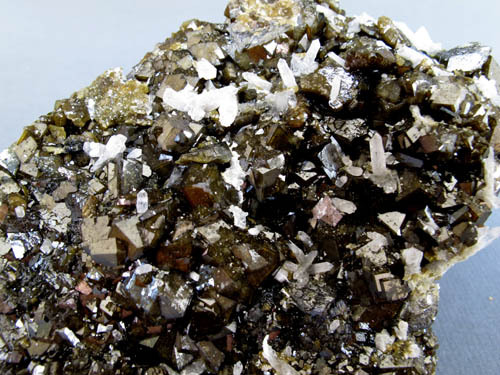 Arsenopyrite specimens of the size, richness and crystal style are very uncommon from this noted locale. JC9394. Arsenopyrite, pyrite, muscovite. Panasqueira mines, Covilha, Castelo Branco district, Portugal. 9.5 x 10.5 cm 834g. $125.00. 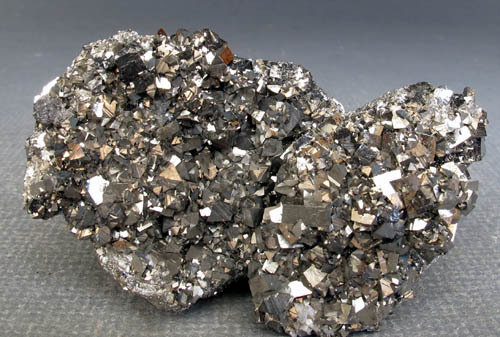 A flat plate of arsenopyrite crystals measuring approximately 2 cm in length on the larger crystals, to about 1.5 cm in width. Muscovite is present as bladed aggregates, many of which have been partially coated with a thin film of microscopic pyrite crystals giving them a nice sparkle. There is a broken ferberite crystal on the extreme left edge in this photo, with a couple of small terminated ferberites attached. There is a broken off quartz crystal about dead center in this photo. A few of the arsenopyrite crystals have been bruised/chipped, and there is one area of damage on the top edge of the piece. JC9338. Arsenopyrite, quartz. Panasqueira mine, Covilha, Castelo Branco district, Portugal. 10 x11 cm 892g. $150.00. Three old collection labels on the back. A flat plate of brilliant silvery crystals. There are several broken crystals that appear to have broken in the pocket and partially rehealed and a few that appear to be chipped...they do not detract from the overall appearance. The quartz crystal has a chip out of the back side of the termination. JC8655. Arsenopyrite. Huanzala mine, Huallanca district, Dos de Mayo province, Huanuco department, Peru 3.5 x 8 cm 93g. $75.00. Stout, brilliant, prismatic crystals on a curved matrix. Purchased from Dan Belsher (Worldwide Resources), December 1992. Ex Crowley collection #1066. JC6964. Arsenopyrite, loellingite, fluorite. Huanggang mine, Keshiketeng Qi, Chifeng, Inner Mongolia autonomous republic, China $150.00 5.5 x 7.5 x 6 cm tall. Bright sparkling arsenopyrite is coating the loellingite blades. Implanted on the arsenopyrite are a few octahedral colorless fluorite crystals. Minor calcite is shown as white patches on the specimen and appear etched, so I'm guessing the specimen has been acid etched to get rid of much calcite as possible. JC6964. Another view. One of the more bladed loellingite crystals is on the left side. JC6965. Arsenopyrite, ilvaite. 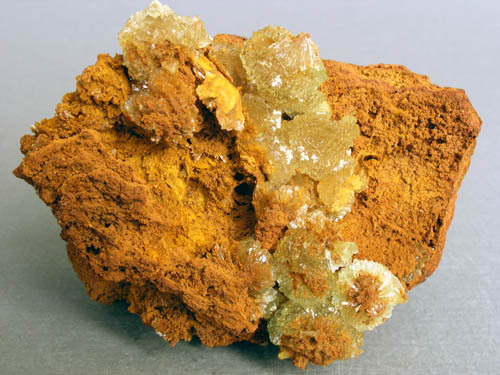 Huanggang mine, Keshiketeng Qi, Chifeng, Inner Mongolia autonomous republic, China 9.5 x 9.5 cm >1000g. $500.00. Initially fairly common, these rounded masses of arsenopyrite coating ilvaite crystals are pretty much gone from the market already. Very unusual arsenopyrite. The ilvaite crystals are the black area in the center. I took several shots rotating the specimen from different angles. JC6965. Another view. The ilvaite is the black crystal in the center. JC6947. Arsenopyrite. Hercules mine, Ticapampa district, Recuay province, Ancash department, Peru. 4 x 7 cm 132g. $150.00. Minerals from the Hercules mine are very rarely found on the market, and were quite limited on the market when the mine was operated. This one was collected in the late 1980's time period. The mine is currently closed. JC6947. A view with the specimen tilted slightly to show the different crystals. JC8680. Atacamite. La Farola mine, Cerro Pintado, Las Pintadas district, Tierra Amarilla, Copiapo province, Atacama region, Chile. 5 x 7.5 cm 94g. $5.00. Somewhat blurry photo, my apologies. Few sprays of brilliant, dark green atacamite on blue chrysocolla. JC8681. Atacamite. La Farola mine, Cerro Pintado, Las Pintadas district, Tierra Amarilla, Copiapo province, Atacama region, Chile. 2.5 x3.5 cm 30g. $7.00. Sawn back. Brilliant dark green atacamite on greenish blue chrysocolla. JC8179. Aurichalcite, calcite. Ojuela mine, Mapimi, Durango, Mexico. 5 x 9 cm 196g. $15.00. Small scattered patches of aurichalcite and rosasite on drusy calcite. ON SALE, TAKE 20% OFF THE MARKED PRICE. JC8179. A little closer view. JC9508. Axinite, quartz, albite? Nausherwani mine, Char Kohan, Kharan district, Balochistan, Pakistan. 7 x 10 cm 351g. $50.00. Sawn base. Quartz occupies the central area with albite, and poking through are glassy brown axinite blades. 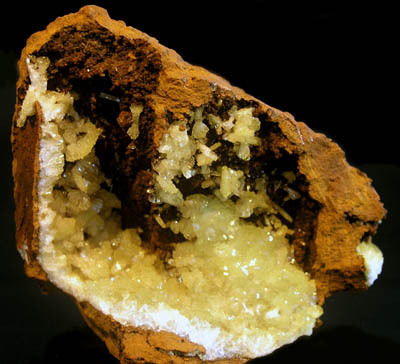 Some of the axinite crystals are coated/partially coated with tiny drusy quartz crystals. The crystals measure from 1 cm to 2 cm wide on the largest crystal. There are a few broken crystals, the most obvious one visible in the lower left center where it is embedded in albite?. JC9508. Another view. The 2 cm crystal is visible on the left side, and is edge on to the photo.